People with dry eye have a diminished tear film on the surface of their eyes. Three different layers make up the tear film. There is the bottom mucous layer, middle water layer, and out lipid or oily layer. There are two major defects in the tear film that cause dry ryes. One reason is there is not enough production of the liquid or water layer of the tear film. The second reason is a decrease in the production of the lipid layer of the tear film. The lipid layer covers over the water layer protecting it from evaporation. 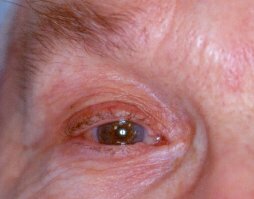 If the eye remains dry for a period of time, inflammation of the eye begins causing more symptoms. As many as 20 million people have dry eyes in the United States. Nearly twice as many women have dry eyes as men. The most common category of people with dry eyes is post-menopausal women. 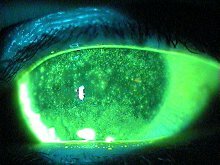 New evidence shows that there are testosterone and estrogen receptors on the cornea (clear portion of the eye), meibomian glands (glands located in the upper and lower eyelids that produce the lipid layer of the tear film), and lacrimal gland (produces the water layer of the tear film). The levels of the hormones play a significant role in the production of the different layers of the tear film. In pre-menopausal women, increased testosterone levels decrease tear production and increased estrogen levels increase tear production. In post-menopausal women, increased estrogen decreases tear production and increased testosterone levels increase tear production. Menopause causes a reversal in how hormone levels affect tear production of the eye. Treatment includes the typical artificial tears, warm compresses to the eyelids, punctal plugs, and Restasis. Other newer treatments are omega 6 fatty acids from plant sources to decrease the inflammation in eyes from dry eye syndrome. LipiFlow treatment for meibomian gland dysfunction (decreased lipid layer) works well for women after menopause and decreased lipid layer in their tear film. Good nutrition, drinking plenty of water, evaluating medications that you are using that may contribute to dry eyes, good night sleep, and proper blinking can help with treating dry eyes. Post-menopausal women should make sure that their hormone levels are at proper levels. There is new evidence that testosterone cream applied to the eyelids improves dry eyes in menopausal women. Dry eye syndrome in post-menopausal women is extremely common. Hormone levels play a significant role in the development of dry eyes. The hormone levels need to be controlled along with using the other forms of treatment. LipiFlow and testosterone cream are newer treatments for the treatment of dry eyes.